1. They must RECOGNIZE False Teaching/Teachers (Titus 1:10-13). How do we recognize a false teacher? A lot of false teachers seem sound, seem sincere and loving and passionate….but listen carefully because they are very good at twisting God’s Word. They will rarely teach from the scriptures; easily take scripture out of context; teach out of books rather than the bible; deny the inspired, inerrant, infallible Word of God; will talk about Jesus, but not preach the gospel; deny the virgin birth; deny the deity of Christ; deny the literal resurrection of Jesus Christ; deny the second coming of Jesus Christ; they will not teach about sin; our need for salvation; they don’t believe in hell; the promote freedom but are slaves to sin, depravity, immorality; they are arrogant, prideful, hate authority, and focus on the world. It is not about what Jesus has done for us; it is about what we can do for God. You can recognize a false teacher by observing their character, their tactics and their motivation. 2. They must REBUKE False Teaching/Teachers (Titus 1:13-14). False teachers and their teachings are so dangerous that it requires corrective and immediate action. Our spiritual health depends on the truth of God’s word, not false teaching. 3. They must RESIST False Teaching/Teachers (Titus 1:15-16). Immersing ourselves in the Word of God will enable us to resist false teaching. Knowing God’s Word is key. This study, Portrait of an Apostate, is for the purpose of recognizing the many false teachers/apostates in our midst, and encourage believers to stand fast in the faith. The simple definition of an apostate is this, an apostate is someone who knowing fully the gospel and the teachings of scripture, professed faith in the Lord Jesus Christ, and turns against it in complete final rejection. I do not believe that an apostate was ever truly born again. More on this later. In these last days, we are seeing many once “professed” believers, some we know, some who are well known, turn away from the truth and reject the Christian faith. The Bible teaches that those that knowingly and deliberately turn away from Christ, the gospel message, and the truth of scripture have committed blasphemy of the Holy Spirit and become the enemy of Christ. As the tide of public opinion turns against the acceptability of being a Christian, two things are happening. Those who are truly born again are moving closer to God and to each other, and those who are Christian in name only are embracing the ways of the world and completing their move away from the faith they never fully embraced. It’s the latter group that constitutes the Great Apostasy and is the fulfillment of 2 Thes. 2:3, 10-19-13. Again, the book of Jude is a book of warning and urgency. Jude writes about false teachers who infiltrated the Christian community, and who needed to be called out, condemned and removed from the church. Jude noticed that apostate teachers often peddled their goods unnoticed by faithful followers, and so he wrote to heighten the awareness of believers to stand against those working against the Lord Jesus Christ, and His kingdom. 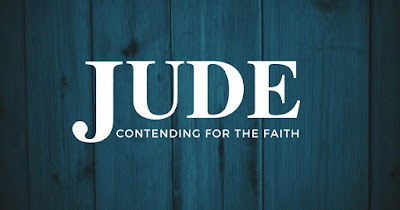 So, the book of Jude encourages us to contend for the faith, to recognize an apostate, and to build each other up in the faith, remembering the teachings of the apostles, the fundamentals of our faith, praying in the Holy Spirit and keeping ourselves in the love of God. What Does An Apostate Look Like? Here we have a very descriptive portrait of an apostate, a spiritual criminal if you will. This is someone who is dangerous to the body of Christ, just as any criminal is a danger to the public at large. When there is a criminal on the loose, our law enforcement agencies put out a picture of a criminal to warn others. God too has given us a picture of an apostate, so that we can recognize, beware and be safe. In five very graphic word pictures, God gives us the marks of an apostate. Now, there are a lot of “Christian” folks out there who not only believe this is not relevant to the believer, but also believe we are not to “judge”, name names, or warn the body of Christ against false teachers. I know many of you have heard over and over “Judge not, least ye be judged.” Matthew 7:1 It has become the resounding mantra of compromise and false unity. Not only is it relevant, it is vital. God who is love has made sure these warnings were written down for us, that we might know the truth and be free from the snare of Satan. The devil is not against religion, he is immersed in religion and uses religion to entangle, to deceive, to lead astray, to rob, steal and destroy those who don’t turn away from false religion and turn to Christ. In Titus chapter 1, Paul writes about the unruly, vain talkers and deceivers whose mouths must be stopped because they subvert whole houses, teaching things they out not to…for filthy lucre’s sake! In verse 13, he says, “REBUKE THEM SHARPLY!" Why? That they (the Christian community) may be sound in the faith. Not giving heed to fables, and commandments of men that turn from the truth(apostates). Rather strong words don’t you think? How does going along with (false teachers/teachings) to get along with (in the church or society) glorify God? How does compromise promote the Gospel of Jesus Christ? The answer is that it doesn’t! Doing so is not only shameful, it renders the gospel ineffective. If all roads lead to the same place, then Christ died in vain. Getting back to Jude verse 3. Today those who earnestly contend for the faith are accused of being narrow-minded bigots by the liberal culture. Somehow we have become un-American, racist and hateful if we don’t just embrace the idea that all religions are the same. In today’s culture, individual rights of the “majority” no matter how immoral because they reject God who created them, and have made gods after their own image, opposed to the truth of God’s Word and His authority. Popular culture is not what a believer should be embracing. Like Christ, we are to look for a kingdom that is not of this world, the kingdom that is to come, where Jesus sits on the throne. Satan is the god of this world, and he is busy building himself a throne, designing a one world system of government, religion and economy to rule over. But here’s the thing, I read the end of the book, and it tells us that Satan and his kingdom will be destroyed, along with all those who followed him. Following after this world and accepting it’s values will lead you in the way of the apostate….and the end will be destruction. All the religions of the world have something in common, they are all false! Christianity stands apart. It is based on a living relationship with God. Christianity is a faith that was once (for all) delivered to the saints (vs3), not to Muslims, Mormons, Jehovah Witnesses, New Agers, Hindus, Buddhists and thousands of other false religions. Scripture tells us that it was delievered to who? The saints. How important to know the Word of God! While the Church reaches out to the non-believers with the gospel, she also must contend for the faith against false teachers and apostates who have crept into the Church. The Church is now facing a very challenging problem. There is such a battle going on within the church over the Bible. These impostors deny the authority, inerrancy and infallibility of the God’s Word, thus denying the foundations of our faith and the doctrines of scripture. Look at the once faithful Christian denominations and universities…they have departed from the orthodox teaching of scripture and replaced it with their own liberal words. Look at all the perversions of the Bible, who blaspheme the Holy Spirit, and erase what they don’t like, change genders and every other perverse thing. While we observe the things happening in the Church, are you really going to sit back and go along to get along? Why aren’t these folks outraged? Why would they not defend and contend for that which they claim to love? Why would you be more focused on offending the offender than offending God? I urge you to consider these words! The Church is being beat up from without and within and it is for that reason Jude writes the Church. It is for that reason that faithful pastors and teachers and faithful men and women warn the body of Christ. In the past several decades we seen the steady decline in percentages of American ministers who believe that the Scriptures are the inspired and inerrant Word of God in faith, history, and all matters concerning us. Seminaries are now training a new generation of ministers who don’t even know the gospel message. Let me remind you that I am not talking about those outside the church, but those within the church. Those within the church who have compromised the truth for a lie become apostate. An apostate begins to ridicule the truth and then he tries to replace the truth. What is really incredible is there is something about an apostate that will not let him just go away from an orthodox church and start his own church. The scripture says that these apostates have crept in and they are determined to undermine the work of the Lord Jesus Christ in the church. I know a young man born into a family of believers, father a pastor as well as his grandfather. This young man has been given the gospel, taught the scriptures from the time of his youth, attended a private Christian school, went to Bible college and began working in the ministry as a church elder, and in Christian radio. What a privilege, huh? Well this young man left the ministry to attend a liberal college and now denounces his Christian faith. Not only has he denounced his faith in the Lord Jesus Christ, he ridicules Christianity every chance he gets. His rantings can be found all over social media. Calls Christianity a cult. Claims Atheists are Christians who actually read their bibles. Claims the bible is justified hate. Promotes Atheism, and has joined the homosexual community. I can’t tell you how much this grieves me. One young man by the name of Wes lost his confidence in the Bible while attending a liberal Christian college and seminary, as a result, he no longer believes that God exists. He finished his study and went on to pastor a Methodist church. His church members don’t know he is an atheist, because they are somewhat liberal themselves, and the preaching of the gospel and the teaching of doctrine is not vital for them. He admitted that his ministerial colleagues are even more liberal than he is. He claims they have been de-mythologized. They don’t believe Jesus rose from the dead literally. They don’t believe Jesus was born of a virgin. They don’t believe all those things that would cause a big stir in their churches. Here’s another example, Darryl is a guy who sees himself as a “progressive-minded” pastor. He wants his kind of non-doctrinal Christianity “given validity in some way.” He now admits that he is more of a pantheist than a theist, and thinks that many of the more educated members of his church hold to the same liberal beliefs as his own, rejection of the virgin birth, rejection of the supstitionary atonement, rejection of the divinity of Jesus, rejection of heaven and hell in the traditional sense…..and claims he is definitely not alone. In verse 3 Jude says that we are to EARNESTLY CONTEND FOR THE FAITH. The word “earnestly” is where we get our English word, to agonize, meaning to contend with adversaries, to fight and struggle with difficulties and dangers, to endeavour with strenuous zeal , or strive. We are to agonize for the faith. Does that sound like we are being instructed to sit idly by, passively watching as those who have fallen into apostasy undermine the Lord Jesus Christ in the church? Is it unloving to call them out, or to warn others? God in his Word tells us to earnestly contend, and that we will! There is to be a battle for the Bible! Before we go any further with a portrait of an apostate let me say this, not only do we need to learn to recognize apostasy when we see it, but we need to know what the great battle for the Bible is, and the areas of truth that are under attack today. I touched on it briefly above, but these foundations of our faith are the very things that the three “ministers” above flat out reject. 2. The Virgin Birth of the Lord Jesus Christ. That he was born of a virgin (Isaiah 7:14; Matthew 1:18-25; Luke 1:34). If Jesus was not born of a virgin, he is as sinful as you or I. There could be no blood atonement because a Holy God could not accept an unholy sacrifice. No blood atonement, no salvation! No salvation, no regeneration! No regeneration, no heaven for you! Without the virgin birth of the Lord Jesus Christ we are lost and dead in our sins, without hope! 3. The Blood Atonement - This is the substitutionary death of the Lord Jesus Christ on the cross for our sin. That Christ died for our sins according to the scriptures. 1 John 1:7, “But if we walk in the light, as he is in the light, we have fellowship one with another, and the blood of Jesus Christ his Son cleanseth us from all sin.” The apostate does not like the preaching of the blood of Jesus Christ. The doctrine of substitutionary atonement is especially repugnant to them. Justified and saved by Christ blood. Blood of Jesus cleanseth us from ALL sin. Christ is the end of the law, salvation comes through faith. 3. The Bodily Resurrection of the Lord Jesus Christ - Jesus came LITERALLY out of that grave! His resurrection validates Jesus claim to be the Messiah, that His word is true, and provides irrefutable proof that He is the Savior of the world. Without the resurrection of Jesus Christianity is false! Paul said in 1 Cor. 15:14, "and if Christ has not been raised, then our preaching is vain, your faith also is vain." Three verses later, in verse 17, he again says, "and if Christ has not been raised, your faith is worthless; you are still in your sins." Jesus said, “I am the resurrection and the life” (John 11:25). There is no resurrection or eternal life apart from the Lord Jesus Christ. There would be no hope and no future! His resurrection is the triumphant victory of every one who believes. Jesus died, was buried, and rose the third day according to the scriptures (1 Cor. 15:3-4). Note the witnesses: After the resurrection, Jesus was able to eat (Luke 24:42-43). He showed people His hands and feet with the nail prints in them (Luke 24:39; John 20:27), and people even grabbed His feet and worshipped Him (Matt. 28:9). As the reports of Jesus' resurrection were spreading, Thomas, who was doubting the resurrection of Christ, said, "Unless I shall see in His hands the imprint of the nails, and put my finger into the place of the nails, and put my hand into His side, I will not believe." (John 20:25). Later, Jesus appeared to Thomas and said to him, "Reach here your finger, and see My hands; and reach here your hand, and put it into My side; and be not unbelieving, but believing." (John 20:27). 6. The Truth, Inerrancy, Infallibility, Immutability, Impeccability, and the Authority of the Word of God - The Bible is God inspired and inerrant Word! Truth matters. Inerrancy is based on the Character of God, was taught by the Lord Jesus Christ and the apostles, and is fundamental to all other doctrines. A church whose bible is not true, inerrant, infallible, and the authority of God is dead! We’ve done many articles on this subject, but here are some scripture references for you to review: 2 Timothy 3:16, John 17:17; Numbers 23:19; Psalms 119:89; Isaiah 46:9-10…and many others. Hebrews 4:12 (KJV), “For the word of God is quick, and powerful, and sharper than any two-edged sword, piercing even to the dividing asunder of soul and spirit, and of the joints and marrow, and is a discerner of the thoughts and intents of the heart.” Apostates hate the Word of God and will attack it every chance they get. An apostate will deny the very fundamentals of our faith, so fellow believer, do you have God’s Word hidden in your heart? Do you know what you believe and why you believe it? So in review, we not only need to know the character of an apostate, recognize one when we see one, but we need to be able to contend for the faith knowing the scriptures and standing on every word of God. The apostate is dangerous like a hidden rock! Jude calls them, “spots in your feasts of charity”. The word spots literally means a hidden rock beneath the surface of the water. How dangerous is a rock hidden beneath the water? One of the most important things any boat owner must learning how to navigate a boat. Knowing how to get from point A to point B without becoming shipwrecked is crucial. So is the Christian faith. How does one go from being dead in their sin, to being alive in Christ? How does one go from hell to heaven? If you don’t have the proper instruction, you will not make it there. It is the same gospel that Jesus preached, the gospel of the kingdom. (Romans 1:20-21; Romans 3:23; Romans 5:8; Romans 6:23; Romans 10:9-10; Romans 10:13; Romans 11:36). They are rocks in your feasts of charity, when they feast with you, feeding themselves without fear? The agape’ feast, or love feasts originated in the early church. It was a time of fellowship for believers. The church is praying together, worshipping together, fellowshipping together, feasting together when all of a sudden something goes horribly wrong and fellowship is disrupted. The love feast comes to a grinding halt because an apostate has crept in, made himself a rock beneath the surface of the water and begins dividing the body of Christ in order to destroy the fellowship they have with each other and with God. "…feeding themselves without fear” - this literally means they are shepherding themselves, each man doing what is right in his own eyes for his own purposes. They are not under God’s authority. They are not under the authority of God’s word. They are believing what they want, and living the way they want, opposing God without fear. They have no conscience, as Peter says, their conscience is seared as with a hot iron. They are numb, feel nothing and their conduct does so much harm to others, as they sow deception and allow for immorality enticing others to follow. How dangerous and deadly apostasy is. The very things that holds us together, the love of the Lord Jesus Christ and the great truths of His Word, the enemy seeks to destroy. Like Satan said to Eve in the garden, hath God said? So too will one who has fallen into apostasy deny and twist what God has said. Why are we to earnestly contend for the faith? Because apostasy is dangerous to the fellowship of a church, it will split and divide and destroy the foundation of truth and replace it with counterfeit lies. The apostate is also deceptive, Jude likens them to “a waterless cloud”. Going on in verse 12, it says, “clouds they are without water, carried about of winds”. What is a cloud without water? Clouds bring the promise of rain to a dry and thirsty land. Think about all those people, literally millions, who will go sit in an apostate church, and hear an apostate preacher, a pompous, religious windbag, a cloud without water. They will come expecting to receive great things, and go away empty and parched. They will have their ears tickled, and told their immoral sin is not sin at all. They will hear that the old orthodox ways are dead and boring, and the new ways are better and exciting. They will have their programs, their music, their entertainment, radio, conferences, magazines, blogs and books, videos and audios….they will be given all kinds of promises, but end up receiving nothing. Sadly they will not be satisfied. The Holy Spirit will not be there. There will be no Bible truth there. There will be no conversion there. There will be no fruit there. There will be no victory in Jesus there. There will only be lies and deception, and sin and false teaching. How tragic! And the millions that attend these apostate churches will never know who it is they have missed. Who it is that can save them, redeem them and give them a future and a hope. What a description! Can you be any more dead than a tree without fruit, twice dead and plucked up by the roots? A Christian believer is to be like a tree planted by the rivers of water, that bringeth forth his fruit in his season; his leaf also shall not wither; and whatsoever he doeth shall prosper (Psalm 1:3). An apostate is like a tree that is dead, and the only thing he is doing is taking up space in the grove. He is absolutely void of spiritual life and is good for absolutely nothing. You can’t transplant it or prune it because it is dead and will not grow or produce fruit. An apostate might transplant to another church, another denomination, but he is still dead. Apostates are dead in their sin, and cannot produce any fruit because they have no life in them. They have rejected the truth of the Lord Jesus Christ and have replaced the gospel with the deadly poisons of hell. About the only thing you can do with a dead tree is pluck it up by the roots and burn it, and that’s exactly what God is going to do with the apostate church. The Bible says that the lake of fire is indeed the second death. If you are not born twice, you are going to die twice. You will die physically in your sins, then you are going to die eternally in hell. The one thing you cannot get from a dead tree, is fruit. In John chapter 15:16, Jesus said, “ Ye have not chosen me, but I have chosen you, and ordained you, that ye should go and bring forth fruit, and that your fruit should remain.” And in Galatians 5:22-23, “But the fruit of the Spirit is love, joy, peace, longsuffering, gentleness, goodness, faith, meekness, temperance: against such there is no law.” We do not produce fruit, it is the fruit of the Holy Spirit, we bear fruit. Apostates can imitate Christianity, but they cannot bear the fruit of the Holy Spirit because the Holy Spirit is not in them. Jesus said in Matthew 7:19, “Every tree that bringeth not forth good fruit is hewn down, and is cast into the fire.” In Matthew 15:13, “Every plant, which my heavenly Father hath not planted, shall be rooted up.” Jesus makes it clear here, doesn’t he? Next, An apostate is disturbed like the raging waves of the sea, foaming out their own shame. In scripture, many times the sea is symbolic of the world, those who do not know God. Isaiah 57:20-21 says, “But the wicked are like the troubled sea, when it cannot rest, whose waters cast up mire and dirt. There is no peace, saith my God, to the wicked.” Another very graphic picture of an apostate. He is loud, disorderly, unrestrained, noisy and clamorous, full of talk, conflicted and confused but makes little sense if any. He is a seething sea full of discontent, stirring, and churning in the raging waves of the sea. After a storm, you would be amazed what has been spewed up on the beach. Ever go walking on the beach after a storm, I have. There is a lot of stuff out in the ocean you would never know was there until a storm comes, and the sea belches the garbage hiding in the depths of the sea all over the beach. When the weather is calm, you don’t see it, but when there is a storm…stand back! And so it is with an apostate. In fact this is really all false teachers do. They make a lot of commotion. They hype up their congregations with their antics to get a reaction. Remember they are not filled with the Holy Spirit, so they have to fake it, and they come up with such nonsense, such blasphemy that it is even difficult to talk about. Oh the ridiculous spectacle they make of themselves. Drawing attention to themselves, enticing others to follow. How vulgar they are. Their followers are not refreshed by the washing by the water of the word, or drinking from the well of life, their followers leave dry and thirsty and dirty covered in the filth from the sea of lies. That is what Jude is saying about an apostate, he is like a raging sea, spewing out his own form leaving it on the beach of humanity. “Foaming up their own shame…” One teacher describes it like this: “They vomit up the scum of immorality, insubordination, irreverence, false teaching, lies, deception, shameful deeds, deductions and all forms of religious prostitution and harlotry.” YUCK! When a person has heard the truth, and known the truth, and turns from the truth, something happens… His moral discernment is destroyed. He has kicked his conscience to death, that doesn’t mean that he doesn’t understand what he is doing, only that he doesn’t care and therefore restraint is taken away and he is given in to the lusts of his flesh. Deep down in the heart of an apostate you will find deep immorality. How do we know this? In verse 7 of Jude, he links apostasy with Sodom and Gomorrah. In 2 Peter 2:22, Peter says, “But it is happened unto them according to the true proverb, The dog is turned to his own vomit again; and the sow that was washed to her wallowing in the mire.” This is what Jude is saying, that deep down in the heart of an apostate is shame. He is like a raging wave of the sea. He is deeply disturbed in his heart and is not at peace with himself or with God. In his foolishness and hatred for God, he has become like the devil his father deceiving and being deceived. How many have we known that have taken their eyes off of Jesus, put down the scriptures and have had their faith ripped away by false teachers, too many! What they once believed they now reject, and what they now reject they ridicule. A wandering star is not really a star at all, stars have a fixed orbit they don’t wander. A “wandering star” has the appearance of a star, bright, and amazing. They catch your eye as they flash through the sky for one brilliant moment, and in the next moment they are gone, they have disappeared wandering around in eternal darkness forever. That’s what Hell is going to be like, the bible describes Hell as a bottomless pit. In Matthew 8:12, “But the children of the kingdom shall be cast out into outer darkness: there shall be weeping and gnashing of teeth.” "To whom is reserved the blackness of darkness forever;” - this describes the dreadful nature of their punishment, it is reserved for them forever according to 2 Peter 2:17. This is the portrait of an apostate and this is the judgement awaiting them. I grieve for those who have turned their backs on God and have walked away from their faith. I pray for those who have itching ears, those who are not grounded in the word of God and who have not truly been born again. Speaking lies in hypocrisy; having their conscience seared with a hot iron.” Notice how Paul describes them: mouthpieces for demonic spirits, teaching doctrines of devils, they are hypocritical liars and without a conscience. Apostasy is deliberately siding with the enemies of Christ (Phil 3:18) despite the knowledge of the gospel. Most of the apostates mentioned in the bible were false apostate teachers, not backsliders. Hebrews 10:27 refers to them as adversaries of God. Let me clarify something very important. I am not talking about those who are struggling with weaknesses, or backsliding, they can be brought to repentance and completely restored to fellowship. Nor am I implying that one can lose their salvation. True believers CAN NOT lose their salvation! Let me reiterate this, a person who has truly been born-again of the Spirit of God CANNOT LOSE THEIR SALVATION! The apostate was never truly born again. He was an impostor, a hypocrite, a deceiver who has heard the gospel, understood the gospel and have completely rejected it! That is the difference. Remember the Parable of the Wheat and the Tares (Matthew 13:24-30)? Anyone who grows a garden knows that you will always find two types of plants. At first you can’t tell the difference because the plants look so much alike that you don’t want to pluck out the weed for fear of destroying a plant. But as time goes on and the fruit of the plant begins to grow, it is very easy to see which plant is real and which one is the impostor. So it is in the church. There are true, born-again believers sitting next to pretenders. The pretenders are there for the nice atmosphere, social gatherings, and great music. The believer is there to feast on the Word of God, to grow in the grace and knowledge of the Lord, to enjoy the true fellowship of fellow believers as the minister to one another in the love of Christ. It is completely possible to faithfully attend church services, even agree with the teachings of scripture and still not be saved. You can call yourself a Christian all you want, but unless and until you take the gospel to heart, believe on the Lord Jesus Christ and be saved….then you are deceiving yourself. God’s warnings to the spectator, or the pretender are serious and have everlasting consequences. According to 2 Peter 2:15 apostates after hearing and understanding the right way, have rejected and forsaken it. Peter gives the example of Balaam. Balaam knew exactly what God’s will was but because he was allured by the wealth of the ungodly, acted the way he did (Numbers 22-24). He did not sin in ignorance but deliberately sided with the enemy of God against the people of God. As I ponder these verses of scripture, I think about these lost souls and intercede for those are prey to them. I pray for the ones barely escaping, struggling with sin, people who are trying to get out of error and might be persuaded to turn to Jesus. I think about the untold numbers who have been enticed away into sensuality and apostasy who were promised freedom and joy and happiness only to one day find that they will be forever separated from God in eternal damnation after rejecting the gospel of the Lord Jesus Christ. Their punishment will be unimaginable. Here in the book of Jude, we have been given a portrait of an apostate. He is dangerous to the Church. He is full of deception and empty promises. He entices the weak and uncommitted soul away from truth into apostasy. He is absolutely dead and incapable of bearing fruit. He is disturbed in that he has no shame. He is fake, an impostor and miserable. He is filled with vileness of sin, hatred and lies and will spew it on anyone who will listen. Lastly, he is doomed to everlasting darkness and like a wandering star will disappear from the presence of God forever. He will face the Lord and judgment will be upon him. In the last days we are to earnestly contend for the faith. We have been given God’s infallible, inerrant word. It tells us how the Lord Jesus Christ the virgin born Son of God lived a sinless life, went to the cross willingly to die, shedding his blood to atone for our sins. He was buried and raised from the dead on the third day, and is now in the heavens and one day the Lord Jesus Christ is coming back to this earth literally, as King of kings and Lord of lords, to rule and to reign forever! Amen! For those teetering on the edge, those who have not truly committed their lives to the Lord, who attend church but are not truly saved, I implore you to take heed. Like the psalmist prayed, “Search me, O God, and know my heart: try me, and know my thoughts: And see if there be any wicked way in me, and lead me in the way everlasting.” Psalm 139:23, 24. Thank you for your Word, Lord, that your warnings are written to wake the sinner out of sleep, and draw them to yourself. Thank you that you equip us to discern the truth from a lie, the true from the false, the faithful from the apostates. Strengthen us to contend for the faith, to be good stewards of your Word, to stand boldly and courageously on the truth of Your Word, so that we might help rescue those who are on the path of eternal destruction. May we be faithful to you until you call us up to our eternal home. Amen!